Following a Labor Day weekend that was surprisingly unterrible in terms of box office, studios might be thinking that momentum could carry over into fall. Of course, things don't work that way, but we can't hold them at fault for that kind of thinking, can we? Hmm, come to think of it, yes, yes we can. Our sole new wide release this week is Riddick, a sort of return-to-form sequel to Pitch Black, following that Dune knockoff that everyone has just decided to pretend didn't actually happen. As Vin Diesel finally just gives in to his limited range and returns to his successful franchises (fun fact: of his listed feature credits, fully 50% are as Dominic Torretto, Riddick, or Xander Cage – and this number is only going to increase), getting back to the one that really launched his career makes sense. It's almost as if we exist in a world where 2004-2009 didn't actually happen, and Diesel's career never got off track. Anyway, director David Twohy returns to the series as it once again finds the title character on the run and on a planet full of horrible things that go “EEEEEEEE” in the night. Luckily, he's still got those built in night-vision eyes, and... cue the carnage. As opposed to the original Pitch Black, this time he's working against monsters and a group of bounty hunters led by Karl Urban and Katee Sackhoff, with Bokeem Woodbine, wrestler Dave Bautista and something called Jordi Molla, who is apparently big in Spain along for the ride in supporting roles. But really, it's just an excuse to watch Diesel talk all growly and kill things in athletically interesting ways in the dark. 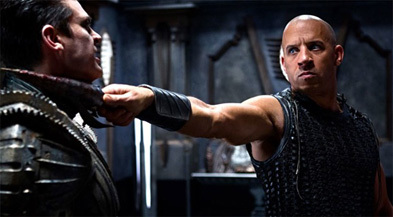 While he's successfully rehabilitated the Fast & Furious franchise through his presence, anyone expecting similar results for Riddick should temper those expectations tout de suite. While it's a stretch to say those films are set in the “real world,” they do have more of an element of reality than Riddick. Sci-fi films always have an extra hurdle to jump over, and in this case, the films it's following were never really that big in the first place. Some viewers may not even be aware it's based on anything at all, it's been so long. And how sad are we for those people? Very sad indeed. It's time to go up to people waving the collected works of David Twohy in their face for their own good. In the meantime, Riddick will have to suffice. In 2004, this name was enough to justify a $24 million opening. A few years ago, this might have been a DTV film, but with Diesel's career CPR, we might be back up to around this figure, and about $18 million is a good target for this film this weekend.